Salamander Designs, Ltd. announced the Salamander Lighting System, a unique, modular LED-based illumination solution for high-quality A/V cabinets. The new Lighting System complements Salamander's line of accessory products that includes: the Furniture Mate, a free-standing, universal mount for HD TVs, an Infrared Repeater that allows a remote control to operate through solid doors, and its group of Power Conditioning Products. The Salamander Lighting System creates the ideal ambiance to complete a home entertainment experience. 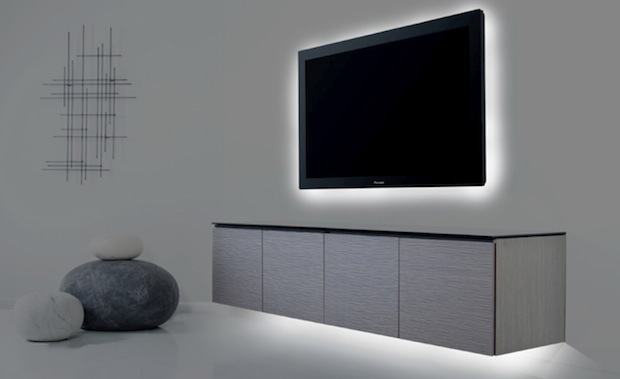 Its slim, versatile rods are modular, expandable, affordable and perfect for subtly or dramatically backlighting TVs, or for highlighting in-cabinet and under-cabinet spaces. Easy to operate, they can be used to brighten a single cabinet or illuminate an entire wall. When turned off, the system is virtually invisible. Best of all, the system's light emitting diodes (LEDS) are designed to last and operate at environmentally friendly low-energy levels. A compact infrared remote allows for full dimming and brightness adjustments. The LEDs are embedded in narrow rods connected to a four-port, USB-type control hub. The basic Lighting System kit includes two 14-inch long rods, the control hub, and a remote control. The Lighting System can be expanded with additional rods of 14 and 23 inches. Custom installers can integrate the remote's controls into larger macro environments or automated lighting scenarios. The new Salamander Lighting System will be available at the end of September at prices starting at $119 for a basic kit.